A perfect blend of stunning visual effects, character development, and even a hint of the avant-garde in this strange superhero film of East-meets-West. Unpredictable. That is definitely not a word typically associated with superhero genre movies. Not that the plot was entirely unpredictable, but Benedict Cumberbatch delivers a very Patrick Stewart-esque performance as the neurosurgeon turned mystic Dr. Strange in the film that bares his name. This is a superhero film that strikes a strategic balance between traditional superhero storytelling and social commentary. Not without the trademark explosions and dynamic action sequences, Doctor Strange is clearly concerned with and focusses on the character development of Dr. Strange. In a film that could have so easily rested its laurels upon the innovative, intriguing, and exquisite visual effects, it chose to place more emphasis on the drama between characters. Ordinarily, if you follow my blog, you know that I do not typically write positively about superhero films, with some exceptions such as: Batman Returns, Deadpool, X-Men: Days of Future Past, or Guardians of the Galaxy; however, Marvel/Disney’s Doctor Strange was incredibly enjoyable as both a movie AND film (and yes, there is a difference). For those in the audience who perhaps struggle with being self-centered, the plot and character development in Doctor Strange will likely ring true and act as a mirror of how you may actually come across to people; and furthermore, how to break the cycle. Although this is clearly a typical blockbuster movie, there are trace-amounts of many elements often found in art house films in the stylistic way some of the sequences are shot. Doctor Strange, a truly multidimensional experience. From Italian sports cars, European watches, and Armani suits to a rundown far eastern temple, famous neurosurgeon Dr. Stephen Strange’s life radically changes after a severe car accident leaves him without full use of his hands. As an expert in the field of bio-medical science, Dr. Strange seeks assistance from traditional western medicine. Convinced that no one except he alone can repair the nerve damage in his hands, Dr. Strange turns to eastern medicine following an encounter with someone who now walks who was paralyzed. Learning that the mysterious enclave of monk-like mystics is a front to a battle beyond the plains of normal existence, Dr. Strange is faced with the decision to use his newly acquired abilities to help fight against the evil seeking to rip the fabric-work of the earth from beneath the feet of millions of innocent citizens or use his powers to regain full use of his hands. With such a deep desire to go back to his successful life in western medicine and to repair a relationship he squandered (Rachel McAdams), he is faced with a monumental decision. No slow wind up here. Doctor Strange‘s prologue is a breathtaking array of choreography and a dizzying spectacle of Inception-like folding of matter and energy visual effects. Instead of wondering why or who, the audience will be in sheer amazement at the beauty of it all. Opening with a prologue like this was critically important for this comic book icon that many had not heard of prior to the announcement of the movie (‘many’ as in those who are unfamiliar with the comics). Director Scott Derrickson (Exorcism of Emily Rose and Sinister) has clearly approached the Marvel universe from a different direction that most others, and it shows just how perfect a decision it was of Marvel/Disney to select him for the job. Although I was greatly impressed with the visual effects and fight choreography, I was worried that I was going to need to take a dramamine to make it through the majority of the movie. But then, it happened. A veritable bait-and-switch. From an action-packed Matrix-y sequence through a view of Manhattan as seen through a kaleidoscope of shapes and distortions to an operating table, I did not know the direction this film was going. Perfect. So often superhero movies are basic–fun–but basic. I also appreciated the humorous juxtaposition between the seriousness of surgery against the backdrop of late 1970’s rock music. Just within the first few minutes of this film, I was convince that this movie was going to be unconventional but strangely enjoyable. Such a great cast! Part of the success of any movie is the cast and the respective roles they deliver. Not merely selected for their respective appearances, the main cast of Doctor Strange each brings a unique blend of talent into the mix. 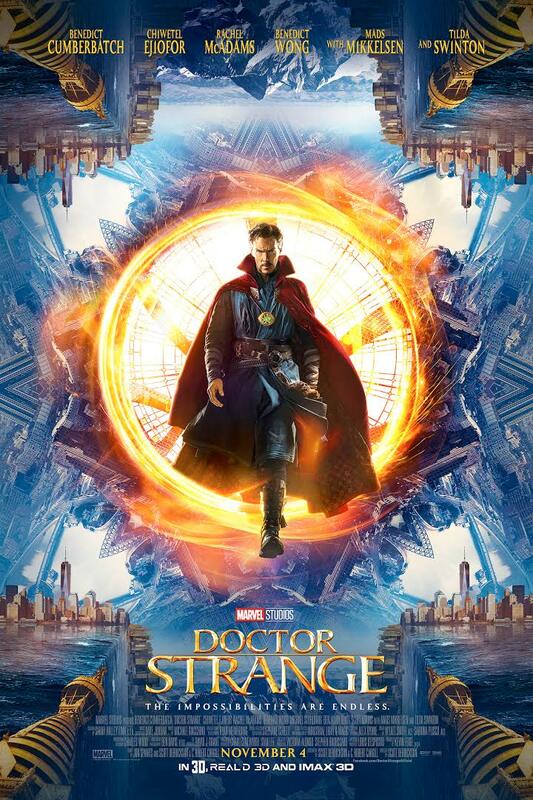 Cumberbatch plays an eccentric ego-maniacal self-centered high on himself doctor extremely well. So well that his development was quite convincing on his journey from selfishness to selflessness. Playing opposite him most of the movie is Tilda Swinton (Wes Anderson veteran actress seen in movies such as The Grand Budapest Hotel, Moonrise Kingdom, and more recently in the Cohen brothers’ Hail, Caesar!) as the Ancient One. She provides the ideal counterbalance to Strange’s over-inflated ego. Difficult to read, I was never quite sure which team she was on, and you’ll have to watch the movie to find out. Her performance was dynamic and convincing. Cast in the role of spurned lover Dr. Christine Palmer, Rachel McAdams does her McAdams thing so incredibly well. I also greatly appreciate how even when dressed in hospital scrubs she still graces the screen with her beauty. She may have bet spurned by Strange, but she gives it right back to him. Each and every member of the principle and supporting cast truly contributed to the success of the storytelling in this film. At the core of this film is solid writing. The characters are multidimensional and the writing contains a bountiful buffet of bright, brisk entertainment that typically seems to do justice to the feel of the comics. Not saying the all the Marvel Movies (whether Disney or Fox) are better comic book adaptations than D.C. (Warner Bros), but they operate on a tried and true method of delivering a visually driven story that appeals to general audiences. Due to the fact that Doctor Strange and other Marvel movies DO rely upon tried and true methods of cinematic storytelling, there is little to no risk for the production and distribution companies. On that note, the D.C. movies are typically more edgy and riskier. Despite the rather dark plot of Doctor Strange, there is sufficient humor here and there to keep the audience from entering into a stagnate emotional state. Whether you are familiar with the comic book series Doctor Strange or not, this is definitely a movie and film worth watching. Even if you have not seen the other Marvel movies (which is doubtful but possible), you can watch this one and not feel lost at all. That is likely due to the fact that Disney/Marvel knew that most people were unfamiliar with this character and needed to be introduced to him and his universe. If you’re into innovative visual effects, then you will be in awe at the effects and editing of Doctor Strange as well. Fair enough. I definitely liked “Deadpool” better. But that’s mostly due to the self-awareness of the film. I don’t typically like the Marvel Movies (nor do I like the DC movies often either). Every once in a while, there is a superhero film that I DO enjoy. And This is definitely one. I was completely unfamiliar with the comic so it was unpredictable to me. However, I recognize your points and respect your opinion. I disagree on the cookie-cutter-ness of the film but I can understand how you arrived at that conclusion. I wasn’t sure if I wanted to see this movie but your excellent analysis of the movie has changed my mind!